We all know what can happen in the glorious sunshine of a tropical island after a few whiskey buckets. Unfortunately animals don’t know about birth control, and with female cats and dogs able to become pregnant from as young as 5 months old, with litters of an average 6 young, our dog and cat populations are out of control. Here at the PhaNgan Animal Care for Strays (PACS), it's our mission to ensure that every stray animal on our island has their health looked after just as much as any pet would. In between us looking after the skin conditions, diseases and broken bones of stray animals, we also spay (sterilise) and neuter as many as we can. But it’s still not enough, and we see new stray litters every week. All born without the love, care and affection they deserve, or more importantly the home, shelter and food they need. To help fix the problem, we want to hire a full time Thai Veterinarian, and have enough medical supplies so we can spay up to 60 animals a month. This will dramatically help reduce the number of unwanted litters we see born every week. We can handle hearing the whimpers, catching stray animals, getting bitten, losing sleep and looking into lost and abandoned eyes while trying to make every PhaNgan animal’s life a little better but we need you to provide the funds to help us do it! Our work so far has seen a slow and steady decrease in the number of street, beach and temple dogs. We want to carry on this work, so that there will be a manageable number of animals on the island – enough so that eventually, each of them can have a loving home. So please donate as much as you can and you’ll get a lot of love and sloppy kisses sent your way! Wee need to start collecting right away to secure a vet for at least 12 months and will be able to Get a Vet once we see our initial goal of £10,000.00 is reached! You’ll get a personalised thank you email from one of our patients to say thanks! Pick a name, and we’ll use it for one of our next doggy/kitty patients. We’ll send you a paw stamped certificate from one of our patients. This would make a great gift! Your name and/or dedication will go on our website as a massive online wet nose kiss for you. We’ll send you one of our PACS t-shirts so you can proudly display your love for us. One of our four legged friends will also pose for a photo with a message of your choice – a great present for any animal lover! 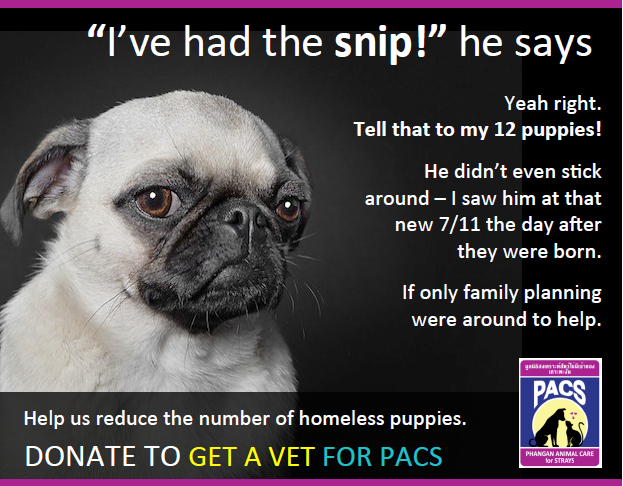 If you have any problems donating via Gofundme, please use our alternative paypal option on the link here: SUPPORT PACS GET A VET CAMPAIGN and state 'GETAVET' to secure your gift and we know how you wish us to use your donation. We now have enough funding for 2 months which is a great start! However, we need to get at least 12 months worth of funding before we can get a vet. Please hit share and help us spread the word. Dogs like Marge are counting on us! Dogs like Marge need our help! Platypus Productions have kindly put together this little video to encourage more people to visit PACS and meet the patients. If you have friends who are coming to Koh Phangan, please pass this along, the more the merrier! Follow the sun, follow your heart. 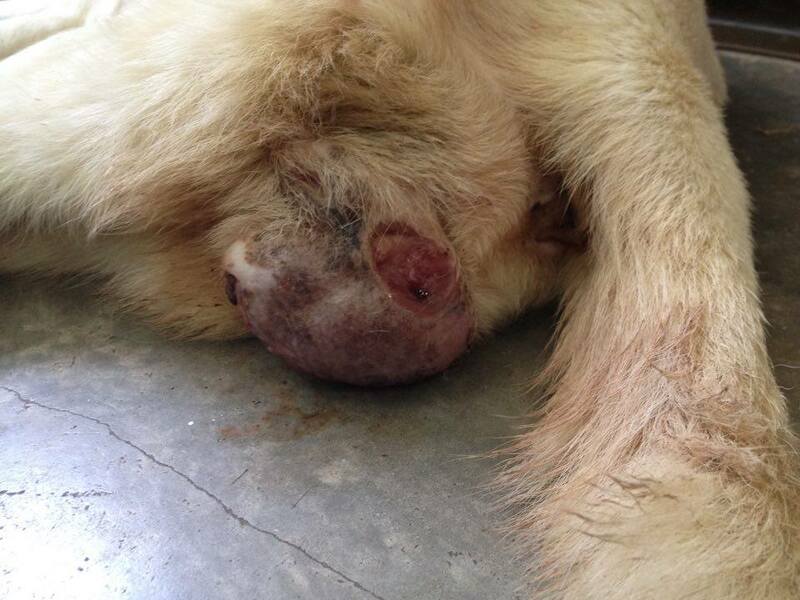 Canine transmissible venereal tumour (CTVT) is a TRANSMISSIBLE CANCER that affects dogs. CTVT is spread by the transfer of living cancer cells between dogs, usually DURING MATING. Animals with this disease should not be allowed to roam free and spread the cancer. They should be kept inside and separate from others. 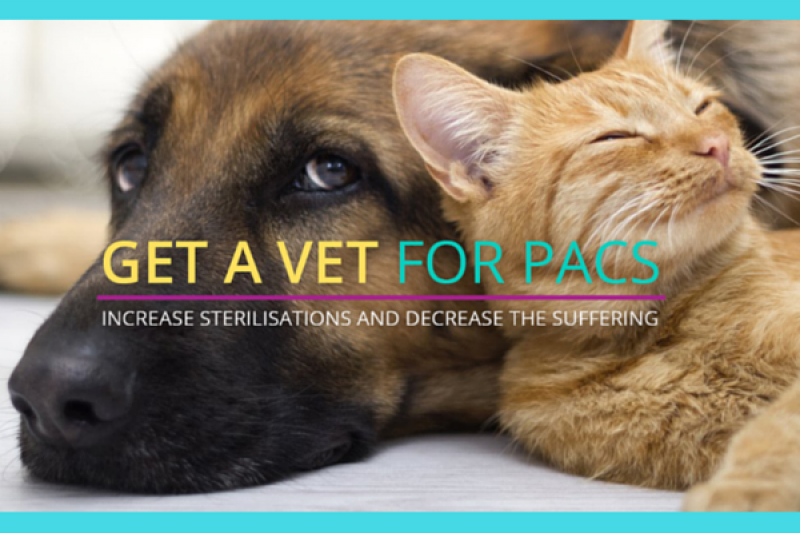 It cannot be treated with a simple antibiotic or wound cleaning, it has to be dealt with by a professional who can administer specific treatment as soon as you see the problem. By donating to this project, you are directly preventing the spread of this awful disease. Thank you for your support!